Baldwinsville Bee's goalie Mark Miller (1) and defenceman Jeff Abbott (29) stop West Genesee Wildcat Zach Lewis (33) scoring attempt in 2nd period action during a CNY Division I ice hockey game on Friday, January 15, 2010. West Genesee went on to post a shutout, 4-0. It felt good to be back in the local ice rink photographing a high school hockey game last Friday night. 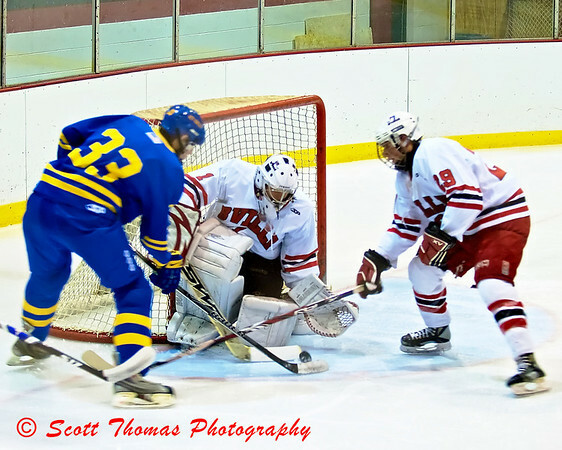 The game featured the New York state number one ranked West Genesee Wildcats being hosted by the Baldwinsville Bees. With the Bees trailing the Wildcats by one game in the Central New York High School Hockey League (CNYHSHL) Division I standings, both teams knew it was a big game. The bleachers were packed with family, students and fans from both teams creating an electric atmosphere. The Baldwinsville High School Band was in attendance and entertained the crowd before and during the game adding to the sounds of skating, sticks slapping pucks and bodies being hit into the ice rink boards. I wish I could say it was a good game. West Genesee kept the puck in the Baldwinsville end for most of the game and ended up winning 4 to 0. The Bees will need to improve quite a bit if they expect to meet the Wildcats again in the playoffs come March. With around six minutes to go in the game there was a lot of action in front of the Baldwinsville net and West Genesee scored. In the melee, the starting goaltender for Baldwinsville, Mark Miller, was injured. The backup goalie, Chris Johns, came out to finish the game. It is not often you see a goalie mask at this level as nice as Chris’ with it’s angry bee and Baldwinsville color scheme. Baldwinsville netminder Chris Johns' goalie safety equipment features a mask with an angry bee, the Baldwinsville High School mascot. I’ll be covering more Baldwinsville hockey games over the next few weeks so look for lots of exciting hockey photos being featured here. 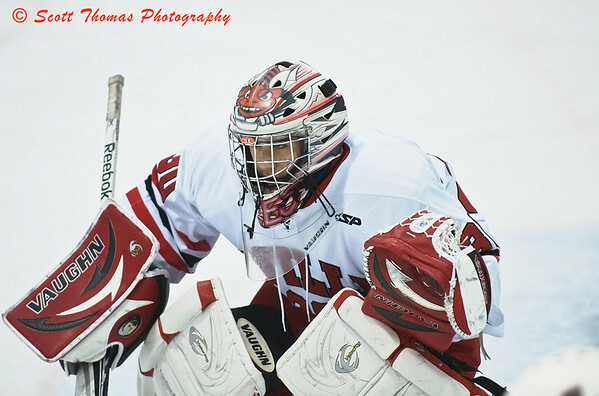 This entry was posted in Sports, Weekly View and tagged 70-200mm, baldwinsville, bees, cny, greater baldwinsville ice arena, high school, hockey, ice, new york, nikon D70, noise ninja, Photography, section iii, vr, west genesee, wildcats. Bookmark the permalink. 5 Responses to View 108: Hockey! Nice shots, Scott! I love hockey, but have never been to a high school game. Must remedy that. High school hockey is interesting to watch. Like all high school sports, the teams have a wide range of skill which make for exciting games. It was good to see a full house for the game. Makes the players better playing in front of it. Great shots Scott, I coach High School Basketball here in Indiana and never even knew of hockey as a high school sport(shows I don’t get out much) is it as rough as professional hockey and how do they control it to keep it less physical ? Very interesting post thanks for sharing !! The game is not as fast as professional games. The players have a lot more head protection but otherwise it’s as hard hitting as high school football on skates.